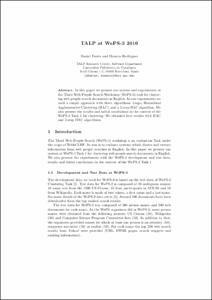 In this paper we present our system and experiments at the Third Web People Search Workshop (WePS-3) task for clustering web people search documents in English. In our experiments we used a simple approach with three algorithms: Lingo, Hierachical Agglomerative Clustering (HAC), and a 2-step HAC algorithm. We also present the results and initial conclusions in the context of the WePS-3 Task 1 for clustering. We obtained best results with HAC and 2-step HAC algorithms. Ferrés, D.; Rodríguez, H. TALP at WePS-3 2010. A: Conference on Multilingual and Multimodal Information Access Evaluation. "CLEF (Notebook Papers/LABs/Workshops), 2010". Padua: 2010.